I’ve been talking to a friend (J.B.) about the possibility of having some posts written by her here. We’re always discussing books, authors, and writing (including, of course, our own writing, our own stories). Today she finally agree to be a contributor here. I know she’ll have some interesting reviews and such in the near future, so keep your eyes open. 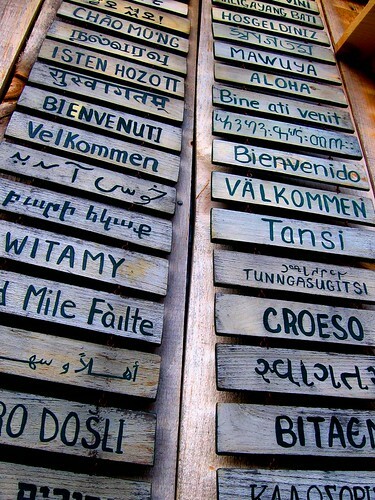 Translation is the process of translating words or text from one language into another. It’s a written or spoken rendering of the meaning of a word, speech, book, or other text, in another language. It sounds pretty simple, right? But translation is much more than that. It’s not only translating words, but communicating the meaning of a word using an equivalent in another language. Some words are easy, right? Colors, for example. Black will always be black, green will always be green, and blue will always be blue. Right? Not really. How about feeling blue? The person is not blue per se, but we do associate the color blue with the way the person is feeling. And how about the expression green with envy? You probably can even imagine someone’s face getting green in this case, but is this the same in other languages? How about if you heard someone saying purple with envy? Would that sound right to you? Well, it is the equivalent to green with envy in Portuguese. Translating a text (any type of text) requires a great deal of knowledge and adaptation. The translator has to adapt the sentence and use the meaning of the words or expressions, not their literal translation. Context is another thing to pay attention to. Have you ever tried to use free online translators? They do help, but unless you have at least some knowledge of both languages, you have to be careful, or you could end up offending someone by accident.